What do women want? This question has stumped the greatest male minds for centuries. Of course, if you’re married, a much better question is, what does your wife want? As Darrin and Amie Patrick reveal in this profoundly practical and transformational book, God designed your wife with the need to be loved. And that design is an invitation for you to love her deeply, intentionally, and passionately. Practicing ten powerful actions, including listening, pursuing, and serving, will transform you into your wife’s lifelong champion and have her nominating you for the Husband Hall of Fame. 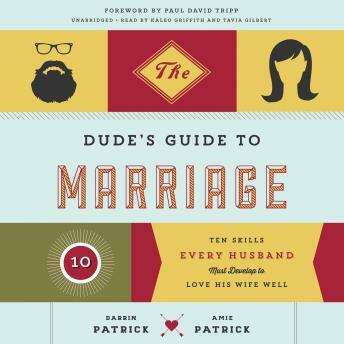 The Dude’s Guide to Marriage is for guys who want to grow, who want clear steps to improving their marriage. It’s for men who want a marriage that thrives rather than just survives. Get ready to be a better husband by becoming a better man.